The 3rd and most powerful model in the Minelab X-Terra range of metal detectors. 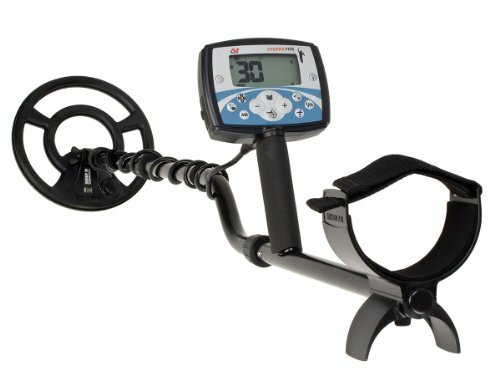 The Minelab X-Terra 705 is a metal detector designed and manufactured both for the novice detectorist all the way through to more seasoned users. Designed in mainly a gunmetal black with a blue and silver decal on the control box. It comes in just a few pieces, the coil, the control box, the stem and the wingnut to attach the coil to the stem. All are easily assembled and click into place with the small lock in rivets. Making the detector secure and sturdy. You can truly feel the quality of this metal detector when holding it. 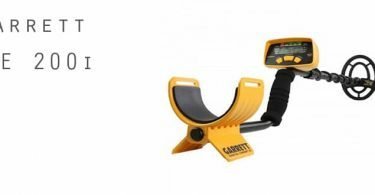 Fully extended the metal detector measures approximately 56″ but can be shortened to 48″ allowing you to adjust the metal detector to your height requirements making it more comfortable to use. It’s not the lightest of detectors but by no means the heaviest you will still feel comfortable using this all day long. It weighs 1.3kg. Velcro strap to attach to your arm to distribute the weight, sponge grip padding and a comfy sponge forearm rest. The stock coil that comes with the Minelab X-Terra 705 is a 9″ DD coil which runs at 7.5khz. The frequency though can be changed with different coils which is fantastic in my eyes. We will talk more about this later. As can be seen above in the picture of the control box there are 12 buttons. None of which are labelled so you’re going to need to read the manual and figure out for yourself what does what. To the left of the LCD screen, you will see we have a power button which simply powers up or down the metal detector. The LED display is clear and it features a back-light for dim conditions. The graphics display will give you a clear indication of the target ID number, battery levels and other menu options you have selected for example a symbol will appear if you have tracked ground balance selected. It shows you your current mode also. Loaded with preset built-in modes and an all-metal, there’s also the ability to customise your search mode in the custom settings. The built-in modes are as follows, All metal which does not discriminate at all. I personally love this mode on the X-Terra 705 and rarely use others. Pattern 1 will discriminate against most ferrous objects. Pattern 2, again discriminates against most ferrous but adds a discrimination notch, taking out certain ID numbers. Pattern 3 is the perfect preset for relic hunting adding in the lower end of ferrous metals and Pattern 4 again the same as pattern 3 but with a few more ID numbers added in. I may have made the above sound rather confusing but I can assure you once you put this detector in your hands it will become very clear what the different patterns achieve. The standard coil that comes with the X-Terra 705 is set at a 7.5khz frequency, however, the frequency can be changed to adapt the detector to other situations and preferences. There are coils available at 3, 7.5 and 18,75khz Low, Mid and High Frequencies. In effect giving you 3 machines built in one by simply changing coils. This is obviously going to cost you a little extra when purchasing another coil however it’s worth it. I personally purchased the Nel Tornado coil for my X-Terra and I found it to be fantastic and very effective. Minelab call this interchangeable coil technology V-Flex. X-Terra 705 boasts automatic ground balance, tracked ground balance and manual ground balance allowing you to fine-tune your hunt. Simply pumping the machine up and down with the ground balance selected will set the machine to the best settings, then by selecting tracked it will constantly track the ground beneath you. It’s worth noting that when you locate a target it’s worth switching off the auto tracking until you continue your hunt. Pinpoint mode, when selected will allow you to accurately determine where the item is in the hole. I found the sweet spot to be just in front of the centre of the coil. It gives a great readout on the LED screen as well. There is adjustable Iron mask featured on the detector also, allowing you to pick up good targets while they are next to trash targets. 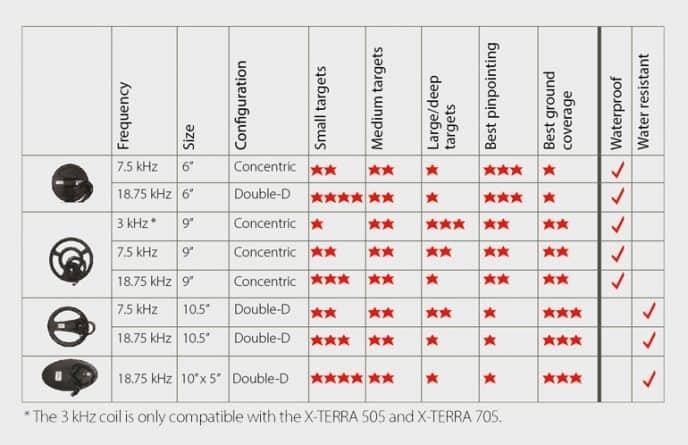 All in all the Minelab X-Terra performs consistently well in all conditions. I have suffered very few false signals while using this detector. I think this is mainly due to the auto-tracking of the ground balance. The metal detector is packed with features and too many to mention. You can change tones to your preference, there are built-in volume control and sensitivity adjustments to name just a few. X-Terra 705 is one of Minelab’s most popular machines and there’s a reason for this. Consistent good performance, the simplicity of use (once you figure out the buttons) and the power of detectors twice the price. Minelab is one of the leading brands in the Metal detecting world and its machines like the 705 that make sure of this. I used the X-Terra for 3 years with not one single problem. It can be used by beginners and professionals alike. In my finds alone with this machine, I paid for it threefold. Don’t take my word for it try it for yourself. You can download a pdf copy of the manual for the Minelab X-Terra 705 here. These settings are in my own opinion and everything depends on the conditions you are metal detecting in. I mainly set the threshold between 6 & 10, tones on setting 3, increase the sensitivity to the highest possible setting without chatter, noise cancel set to on, auto ground balance on. I generally use either all metal or mode/pattern 1. The X-Terra consistently hits deep targets with precise accuracy and the Minelab X-Terra 705 depth has a range of around 10 – 14 inches. It can hit deeper but the signal begins to become less clear.